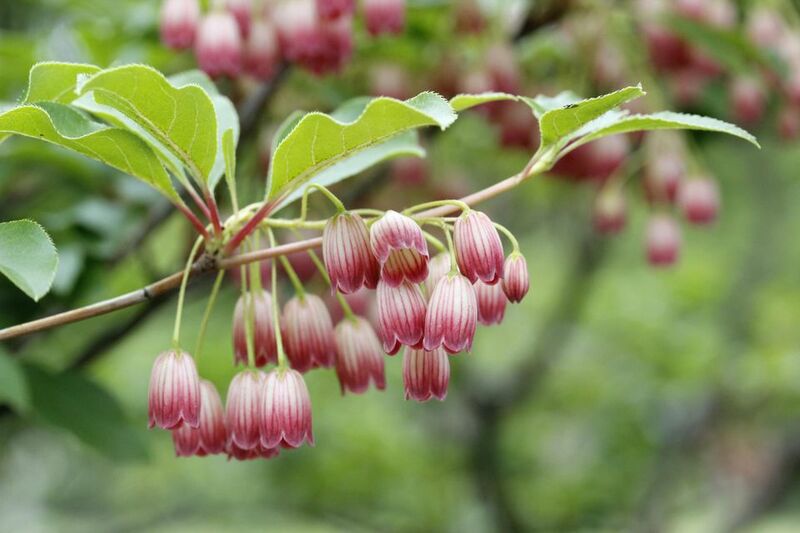 If you have a location with acidic soil, consider planting Enkianthus campanulatus, the red vein enkianthus. In the springtime, this shrub is covered with a profusion of white flowers that feature pink veins. During the fall, the leaves change to hues of red. The Royal Horticultural Society awarded its Award of Garden Merit to the red vein enkianthus. The botanical name assigned to this shrub is Enkianthus campanulatus. It is part of the Ericaceae family. The genus name of Enkianthus is Greek in origin and combines two words. Enkyos mean swollen or pregnant and anthos means flower. The species name of campanulatus was given to note that the flowers are shaped like bells. Names for this shrub include red vein enkianthus, red vein enkianthus, and furin-tsutsuji. Garden locations in Zones 5-7 are suitable for this Enkianthus species. Its native range is found in Japan. This shrub will be 6-15' tall and 4-9' wide at maturity. Enkianthus campanulatus needs a planting site that offers full sun to partial shade. The elliptical leaves on this shrub are 1-3" long and will change to shades of red, orange and yellow in the fall. The bell-shaped flowers are typical for the Enkianthus genus and other plants in the Ericaceae family. They can be white with pink stripes or dark red. After pollination occurs and the blossoms fade away, small brown capsules will be formed. If you want a flower that is solely white, look for the 'Albiflorus' variety. 'Showy Lantern' has dark pink blossoms. 'Sikokianus' has red blooms. For leaves with a white variegation around the margins, look for 'Variegata'. Dwarf varieties include 'Wallaby' and 'Hollandia'. This species is slow to grow and may take many years to reach maturity. This Enkianthus shrub is ericaceous and will need a location that offers acidic soil. If the pH is close, you can work on making the soil acidic, though you will need to test each year and make sure that the levels are still low enough. Propagation is carried out through seed germination, cuttings, and layering. If you are trying to grow a named cultivar, you will need to use layering or cuttings so that their key features do not disappear. The red vein enkianthus naturally forms into a pleasant shape and the only pruning you should need to do is take care of any branches that have become dead, diseased or damaged. Prune just after the plant has finished flowering so you do not affect the next year's blossom crop. Not many pests bother the Enkianthus campanulatus plant. You may see spider mites on occasion, which can be removed by shooting water at the mites or using a horticultural oil on days that are not hot. There are usually no problems with diseases on the red vein enkianthus.